On Thursday, November 17 Fairfield University held its third annual Thanksgiving Multi-Faith Service in the Egan Chapel of St. Ignatius Loyola. "The Multi-Faith Thanksgiving Service is an annual tradition that is a true celebration of the diversity of the University community. The service is an opportunity for inclusive engagement in the elemental human activity of expressing gratitude, which is foundational to the University’s commitment to educating men and women for others," stated Rev. David Spollet. Building on the success of last year’s service, the event brought together a broad range of traditions including prayers, music and readings from Judaism, Christianity, Islam, Hinduism, Buddhism, and Secular Humanism. The service also featured a personal reflection from Anmol Tabassum ’18. At the conclusion of the service, students, faculty and staff lighted candles to symbolize their reasons for giving thanks and engaged in dialogue on the source and object of their gratitude. On Friday, November 18, Fairfield University hosted its annual Diwali Celebration. Diwali, or the Festival of Lights, is a five-day celebration that includes food, dancing, and music in celebration of life. Raja Sai Nakka '20 stated, "It is a festival symbolizing victory of 'Good over Evil', 'Light over Darkness' and 'Knowledge over Ignorance.' Regardless of many mythological anecdotes and significance to varies religions, it has been embraced by many people with a strong desire to celebrate the true essence of multiculturalism. As we light diyas, exchange sweets and gifts during this auspicious occasion, we are limited of what Diwali in current world stands for; which is genuine commitment to friendship, religious tolerance, reaffirmation of hope and above all spreading the world of Peace and Harmony." At the beginning of the event, students, faculty and staff participated in a lighting and prayer ceremony. During the festival, students were treated to a fashion show, lighting ceremony, traditional food, and group and solo dance and singing routines. This year’s Diwali Celebration was a part of International Education Week. International Education Week was a weeklong series of events to celebrate the diverse cultures represented on our campus and to showcase the benefits of international education and exchange. This joint initiative is part of our university-wide effort to promote cross-cultural awareness and understanding to prepare our students for a global environment and job market that is increasingly multilingual and multicultural. 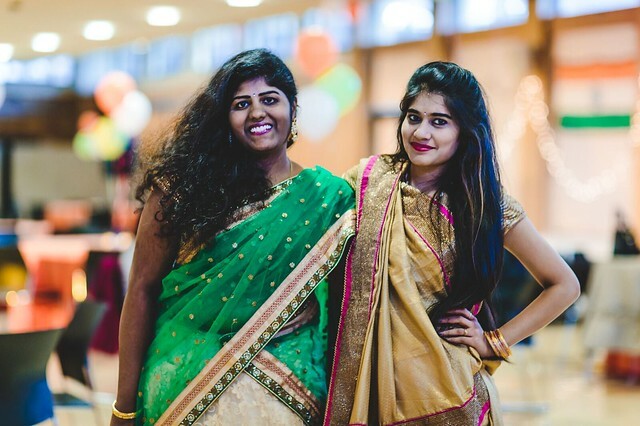 Pictured: Prathyusha Reddy (left) and Mounika Siriguppi (right) at Diwali.